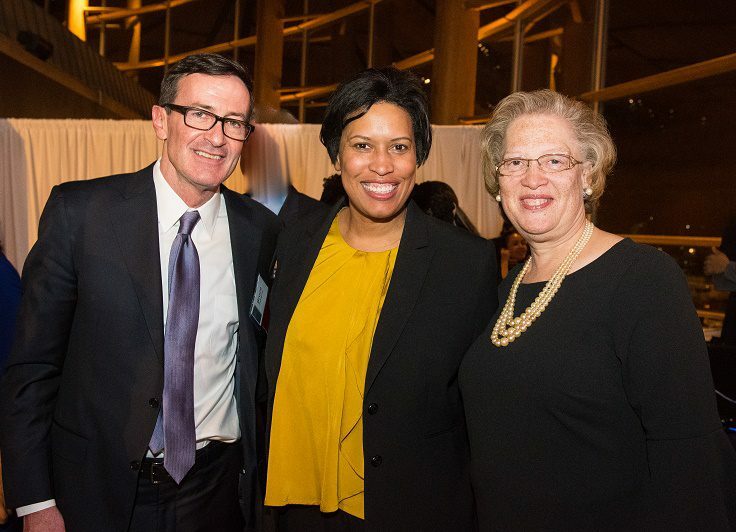 I was proud and truly honored to receive the 2018 Civic Spirit Award from the Greater Washington Community Foundation. I am thankful to be recognized for my life’s work to help make D.C. and our region one of the best places to live, go to school, work and do business. As I mentioned in my acceptance speech, I am so grateful to have had the opportunity to chase my dreams and accomplish my goals. It is thanks to all the people in my life (my parents, grandparents, husband, siblings, mentors and friends) that I have been able to realize my dreams. Since 2003, I have been focusing on ensuring that every young person in this region, specifically our most vulnerable youth, have the opportunity to realize their dreams just like I did. I’ve taken some time to reflect on my life, career and accomplishments and realized that for us to continue moving forward and to be able to make this city, region and the entire country a better place for our young people, we must work together. Many of the same challenges that existed more than 50 years ago still exist today and it will take everyone in this community to fight together to change that. This month marked the 50th anniversary of Martin Luther King, Jr’s. assassination on April 4, 1968 in Memphis, Tennessee. I – along with the rest of the nation – have spent a lot of time thinking about Dr. King’s work, his assassination and its aftermath and the way that these events impacted our society over the years. As we all know, Rev. King, an American Baptist minister and activist, became the most visible spokesperson and leader in the civil rights movement from 1954 through 1968. While his leadership is revered, it is distressing that we are still faced with the same or similar issues he worked so hard to end over 50 years ago. On March 31, 1968 Rev. King delivered his last sermon, “Remaining Awake through a Great Revelation” at the National Cathedral in Washington, D.C. In the speech, he referenced racial injustice, poverty and the need to find an alternative to war and bloodshed. And in other speeches and reports of that time, lack of access to quality affordable housing, subpar public schools and aggressive policing of black and brown communities were identified as needing immediate attention. Since the 1970’s some progress has been made – but too much has remained the same or gotten worse. In Greater Washington we are working to address the issues raised in Rev. King’s last sermon and outlined by the Kerner Commission in their report to President Lyndon Johnson. The challenge for us is to find the will to work across sectors, generations, races and ethnicities and geographies so that 50 years from now we can celebrate solutions and significant progress. I am a true daughter of Washington, D.C. I was born in Freedman’s Hospital on the campus of Howard University. I grew up in Petworth; graduated from Theodore Roosevelt High School; and have felt loved and supported by my family, church, DC public schools and this community throughout my life. 1968, fifty years ago, was a pivotal year in my life. I remember vividly the fear and insecurity I felt when the riots of 1968 broke out in cities across the country after the assassination of Martin Luther King, Jr. Once the announcement was made and school was closed, everyone was confused, angry and concerned about their safety. Until April 4, 1968 I was focused on getting a summer job, graduating high school the next year and going to the college of my choice. My plans were to major in French, minor in Government and join the Foreign Service to spread democratic principles across the world. But by the end of my first year at Smith College, I could not stop thinking about the social complexities of our country and the challenges I was having in college with writing skills and shifting from learning by rote to learning critical thinking. I was lucky to have my parents who helped me through wondering if I belonged at Smith and a fear of failure. I was also lucky to find the support system at Smith to overcome the fear and be successful. And it was at a political science class at UMass that I met my first mentor who became my connection to politics in D.C. and a job in DC government that launched my career in public administration in 1979. With the guidance of Ivanhoe Donaldson, Mayor Barry, Elijah Rogers and Tom Downs I had opportunities to grow as a manager that resulted in leadership positions in local government, the White House and a major corporation. Throughout all of these positions, my goal was to make our city and region a great place to live, go to school, work and do business. And when I fast forward to 2003 at a time when I wanted to return to Washington after being in Norfolk for several years I was lucky to meet Mario Morino. Through outreach to friends and colleagues I explored opportunities in philanthropy. And after conversations with Ann Allen of the Cafrtiz Foundation and Charito Kruvant they suggested I meet Mario because of his innovative approach to venture philanthropy. When we met I related immediately to his vision for using a business approach to philanthropy and focusing on improving outcomes for our most vulnerable youth. What he didn’t know was I had exposure to education programs at RJR Nabisco’s Foundation and through work with my church in Norfolk. Through these experiences I realized how vulnerable youth of color are. I developed an after-school and summer enrichment program for 8 – 12 year olds in a strip shopping mall across from our church in a neighborhood of federally assisted housing. My experiences in Norfolk prepared me most for working at VPP with amazing nonprofit leaders who needed strategic assistance and growth capital to take their organizations to the next level to serve more youth better. I thank, our founder, Mario, our current chairman, Frank LaPrade and the VPP Board for the privilege of leading VPP and for the outstanding team that stays focused on removing barriers for youth in our region so that they can be prepared for college and careers and become thriving adults that realize their dreams for themselves and their families. Each of the sectors that I’ve worked in represent the smaller pieces that must come together for us to create the larger picture of the community that we want to see for our young people. I’m excited that at VPP, we are bringing the pieces together through our Ready for Work initiative in Prince George’s County. We have brought together government, business, philanthropy and nonprofits to make sure that students are graduating from high school prepared for post-secondary education and careers. We have embedded wraparound support from nonprofits in Suitland High School to break down the barriers that get in the way of our young people’s success, and I am proud of the results that we’ve seen so far. We are also working in Oxon Hill and High Point High Schools to get the same results. Donors and philanthropists, nonprofit and business leaders, educators and government officials – we all are a piece of the larger picture. We must “lock arms” as I like to say and work together to address challenges and create opportunities for all young people in our community. I charge you tonight to embrace collaboration and think of ways that you can to continue to be a civic leader for our Greater Washington region. Again, I want to say thank you for this award and to all of those who have supported me throughout the years – this belongs to you too.